360 E. 76 St. N.Y. This ad for E. McGuinness & Co. from 1876 notes that they were successors to T. McGuinness and that they were also known as the Central Park Iron Railing Works. It also notes that proprietors at E. McGuinness were E. McGuinness and D. E. Reilly. The predecessor business, T. McGuinness & Brother, was located at 4 E. 1st St., and was described in Trow's New York City Directory of 1860 as "saddlery, hardware, heraldic chasers, manufacturers of crests, coats of arms, ornamental rosettes, letters, etc." The brothers at T. McGuinness were Thomas McGuinness and Patrick McGuinness, immigrants from Ireland. They appear in the 1870 U. S. Census living at 334 and 338 E. 55th St. between 1st Ave. and 2nd Ave., Manhattan. Thomas McGuinness gave his occupation as "Iron Railing Manufacturer." Patrick gave his as "Clerk." This is likely to mean that Thomas was the workman who saw to making the iron products, while Patrick handled the business affairs. T. McGuinness was in business through 1874 downtown on East 1st St. Then E. McGuinness, successors, came into being in 1876 much further uptown at 346 E. 76th St. E. McGuinness was Edward McGuinness who appears in the 1880 U. S. Census living in Newark, N. J., age 45, born Ireland, "Iron Railing Manufacturer." His partner in this business was Daniel E. Reilly (1836-?). Edward McGuinness probably died in the mid-1890s, and the business was continued by Reilly on E. 76th St. until approx. 1906. In 1906 Daniel E. Reilly, age 69, applied for a passport where he declared that he was born at Maghera, Ireland, 15 July 1836, that he immigrated from Liverpool sailing on the SS Rocahsmboldt [Humboldt? ], Nov. 1852, and that he became a naturalized U. S. citizen Sept. 1868. He gave his occupation as "retired." He lived at that time at 244 W. 123rd St., Manhattan, and he continued to enjoy (we hope) his retirement at this address until age 90-something. He appears in the 1930 U. S. Census living at this address. His age, recorded as 90, would have been 93 if he was born July 1836. 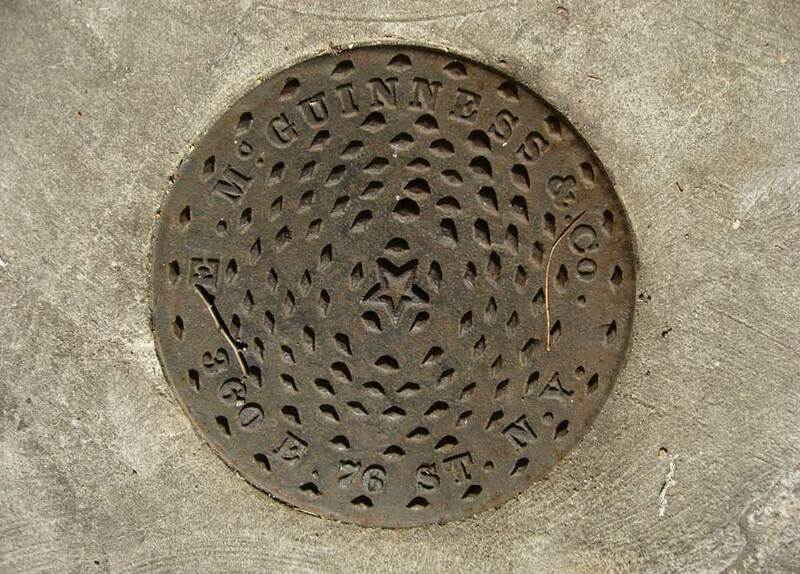 Another McGuinness coal chute cover is located at 39 W. 11th St. near 5th Ave.
E. McGuinness & Co. also manufactured cast iron shop fronts. An example is found at 365 Lenox Ave.